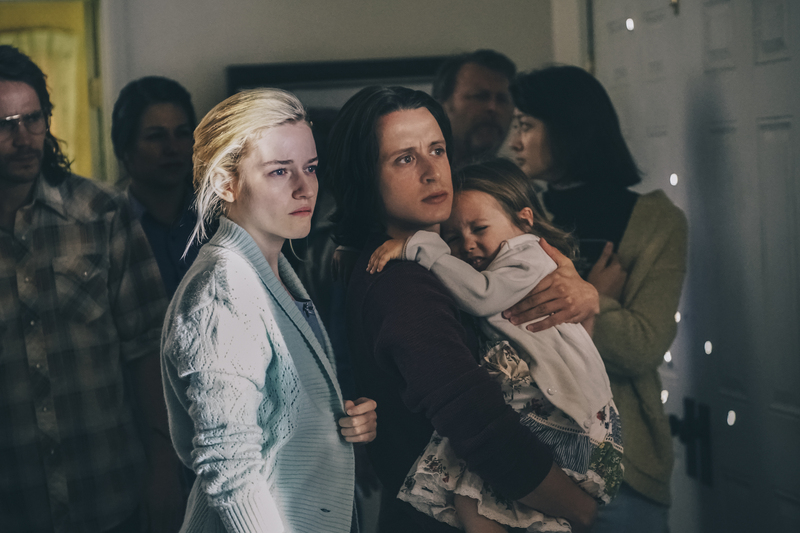 Branch Davidians David Thibodeau (c-Rory Culkin), Michelle Jones (l-Julia Garner) and her daughter Serenity (r-Vivien Lyra Blair) prepare to leave the Mount Carmel religious compound before leader David Koresh renegs on his promise to the FBI in WACO. ©Paramount Network. CR: Ursula Coyote. HOLLYWOOD—February 28 marks the 25th anniversary of the beginning of an infamous standoff between a religious cult known as the Branch Davidians who clashed with federal and state law enforcement agencies in Waco, Texas. For the next 51 days, the world was glued to their TV sets as agents tried to negotiate with the members of the religious group, and its charismatic leader David Koresh. The group was suspected of weapons violations, and the Bureau of Alcohol, Tobacco and Firearms (ATF) went there to issue a search warrant. Aware that women and children were on the property along with armed men, agents initially refrained from bursting into the heavily fortified compound. The negotiations, however, ultimately went south, and the result was a deadly disaster in which the compound burned to the ground and casualties resulted on both sides, including four dead government agents. The impasse captured the world’s attention and the gruesome ending was broadcast live on television, prompting a years-long Justice Department investigation that ultimately found the Branch Davidians responsible for the fire. Others, including some law enforcement personnel who were at the scene of the standoff, speculate that the situation could have been better handled. The terrible tragedy is revisited when Paramount Network, the rebranded Spike cable channel, premieres its TV miniseries, “Waco,” Wednesday Jan. 24 at 10 p.m. ET/PT. 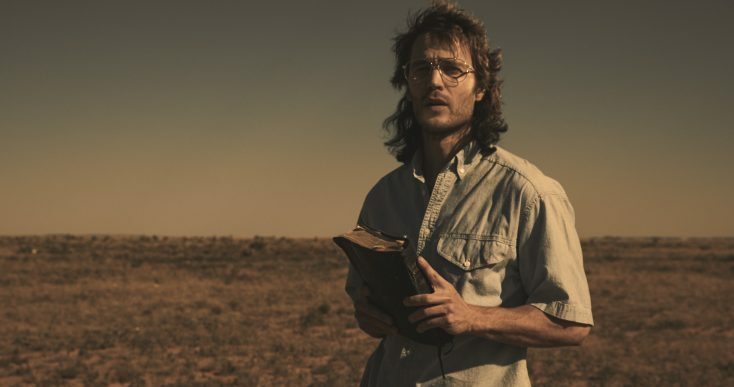 The six-part series stars Taylor Kitsch (“X-Men: Origins,” “John Carter”) as the Branch Davidian leader David Koresh and Michael Shannon (“The Shape of Water”) as FBI negotiator Gary Noesner. Melissa Benoist, Andrea Riseborough, John Leguizamo, Paul Sparks, Rory Culkin and Julia Garner also star. Executive producer John Erick Dowdle explained during the recent Television Critics’ tour that the he and executive producer brother Drew Dowdle stumbled across the project while researching an unrelated topic. “We found David Thibodeau’s book,” says Dowdle, referring to the autobiographical work, “Waco: A Survivor’s Story,” penned by one of the survivors of the compound’s fire. “It’s hard not to read both of these books and not have empathy for both side,” says Drew Dowdle, also an executive producer and writer on the series. The Dowdles, along with stars Kitsch, Benoist, Riseborough and Garner spoke about bringing the tragic story to the small screen. Q: Taylor, what was the biggest challenge for you in portraying David Koresh? Kitsch: Our job, especially when you’re playing a real‑life character, is to go in—and this was something I learned during the process, and it was kind of a hard learning experience—and be honest. I’ve never kind of played anybody like this or remotely close. I was kind of guilty, at the beginning, to listening to other people’s views of (what happened). I would tell somebody, “Oh, I’m prepping for Koresh,” and they would be, like, “Oh, you must be crazy. You’re just going to go play crazy for four months.” It started to sink in, but I wasn’t going crazy. I was, like, “Why? Everyone keeps telling me I should be like this or that or feeling this,” but the more I dived in and the more I worked with John and Drew and reached out to (survivor/author) Thibodeau and reading and actually uncovering Dave’s backstory and, not to get too actor-y, but one of the first questions you ask is “Why?” There are still things that I’ll never have answers to, and I don’t think any of us will, with Dave and this whole incident. But you’ve just got to keep digging and not bring your preconceived ideas or your own revelations through it. Q: What were some of our reference materials you used and what’s your take on David Koresh? Kitsch: I watched videos and listened to tens to hundreds of hours of phone calls with Protective Child Services. This is a guy who came from a terrible upbringing. And this is a guy who lived with his heart on his sleeve. He was very emotional. Obviously, he was incredibly smart, manipulative, very hard. He tested the Davidians and was incredible at making everybody in that house feel they are the only person in that house when he would spend time with them. What he gave to these people is that incredible sense of purpose that we all search for every day. Some of us are lucky enough to have it, and some go their whole life (without it). What Dave brought to so many, through my experience, was this purpose every morning. Q: The women in the compound played an important part in this community, which practiced polygamy. Andrea, can you talk about playing Judy Schneider, one of Koresh’s wives in this? Riseborough: Judy Schneider Koresh was such a dynamic woman and a good egg, just across the board. She just seemed like a very good egg. You’d like to know her and be friends with her. She was incredibly reliable and sort of the matriarch of the situation. What I related to was her loyalty. Yes, it’s not the usual marriage model, polygamy, but there were huge advantages to it in the sense that they shared the burden of the childcare with each other. And I say “burden” because it was very difficult. They didn’t have many resources. Q: How about you, Melissa? You play Koresh’s young wife, Rachel. Benoist: What I found the most interesting about Rachel and Michelle (Jones, played by Julia Garner) is that they were in the church. That was all they knew. They had been there even before Koresh made an appearance. What I found so fascinating about her was how strong I could tell she was, even just in pictures that I saw, and how this relationship she had with David felt like this solid foundation. Everyone there really … supported each other, the women. It felt like a community, too, every day on set. We kind of got into the groove of that. Q: Despite the dark subject matter and intensity of the situation depicted in this miniseries, the mood on the set was lighter than maybe we might expect as viewers. Could you talk a little bit about that being important when you’re dealing with such a heavy subject? Benoist: I also think the nature of the world we were trying to create kind of lent itself to that atmosphere, because there was a sense of community. We were on a stage, yes, but we were in (sets of) the halls of the compound and the cafeteria and the chapel. Drew Dowdle: We did keep a very light set throughout, but then at the very end it, was extremely sad, the last four or five days of shooting, because we shot, obviously, the episodes in order. Episode 6 is just completely tragic, and it was like our characters were dying every day. It was the most gut‑wrenching scene, and our actors were just really bringing it in those scenes. We must have been in tears multiple times a day for the last six days of shooting and that seemed like an appropriate way to end.